With a sizable southerly swell running up the coast, any plans to dive to dive Bell rock was clearly a non starter. Instead a mixed group of divers from Tyneside 114, Bishop Auckland and Durham City divers assembled on the pontoons at Eyemouth harbour and loaded their kit aboard the dive boat. This included a mixture of re-breathers, (two KISS, an inspiration rebreathers) plus an assortment of twin sets and single cylinders. Andy Hunt the dive organiser, in the light of the weather conditions reviewed the options available with boat skipper Iain Easingwood. In the end we headed north up the coast to a mystery wreck site offshore from Fast Castle. According to Ian, this wreck is possibly an old whaling vessel. 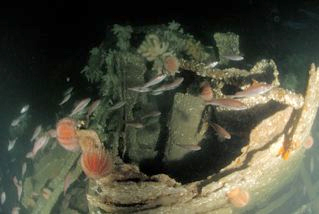 The wreck itself lies in 43m of water and has evidently sunk several feet down into the seabed. Whilst it has lost its superstructure it nevertheless is still very recognisable as a small ship. The weekend’s diving benefited from small neap tides. The shot was located securely into the wreck and we descended straight down the line and at 35 metres the outline of the wreck emerged out of the gloom. The water was dark but clear with torch beams highlighting the plumrose anemones at they clung to the more exposed areas of the wreckage. Moving on, we came across deck winches and anchors strewn amongst the wreckage. 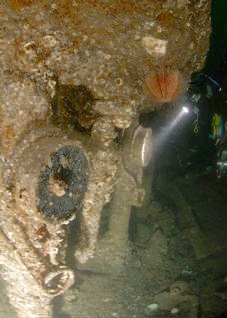 The most impressive feature of the wreck however is the remains of the boiler and engine room. 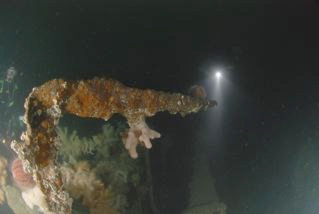 Here a door way and steps lead off into the wreck down into the depths of the seabed. Old brass steam gauges are still in place and a large porthole has collapsed onto the remains of the engine room floor. Fish darting in and out of the wreckage cut through the dancing torch beams. All too soon however it was time to head back up to the surface where after completing the required deco stops, we returned to await pick up in the swell. For the second dive, some of the group opted to do a shallower dive amongst the gulleys that can be found under the cliffs upon which rather battered remains of Fast Castle clings precariously. Those who dived this site reported good scenic diving with plenty of life. There was even a report of a possible sighting of an ancient cannon ball which appeared to be well concreted to a rock. For the final dive pf the day we opted to explore the wreck site of the MV Nyon. 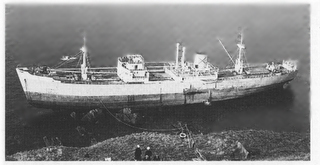 This large cargo vessel of 4956 tonnes ran aground in 1958. The crew were recovered by breeches buoy up onto the overhanging cliffs. The stern section was then cut away from the forward end of the ship when it became apparent that the vessel could not be floated free from the rocks. The salvaged stern section was then subsequently towed away to Holland where it was welded on to a new front section and the M/V Nyon continued to sail on for a few more years until she was sunk in a collision with another vessel in the English Channel on the 15 th June 1962. The original front-end of the vessel was abandoned and subsequently collapsed after a gale and now lies scattered in the surrounding gulleys. Diving on this site some of the large plates have evidently been twisted and battered by the sea, highlighting the power and sheer energy of the waves that are generated by the gales that can hit this part of the coastline. Consequently the wreck site is well dispersed and the dive is very much a rummage amongst the rocks and scenic gulleys that make up this area of coastline. In never the less provides an interesting dive on a site that appears to be rarely visited by other divers. Many thanks to Andy and Iain for organising the days diving.